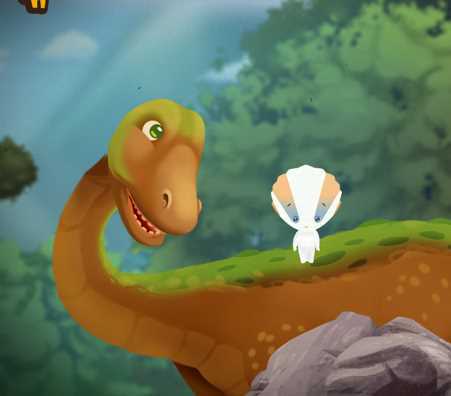 This exciting dino app combines a simple game with an engaging narrated encyclopedia to introduce kids to 10 dinosaurs. Ginkgo Dino introduces kids to 10 dinosaurs. 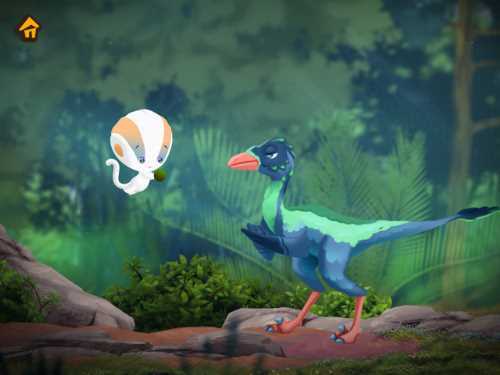 They can explore an ancient forest with the titular character Ginkgo (a time-traveling fantasy creature) to find and play with the 10 dinosaurs. Or players can jump into a narrated encyclopedia filled with fun facts about these now extinct reptiles. 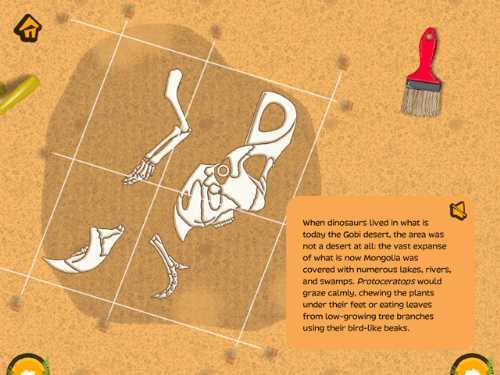 The encyclopedia also offers engaging interactive activities, including digging for fossils. With its two methods of exploration, Ginkgo Dino is fun for both younger and older children. For preschoolers and kindergartners, the "Play" mode sends them into a prehistoric forest of the Cretaceous Period. As they use their finger on the screen to direct Ginkgo to fly, the cute little creature will encounter twinkling stars. Flying over a star triggers an animation involving a dinosaur. Kids will meet Donna the Troodon, Nyam the Velociraptor, Vera the Oviraptor, Batar the giant Tarbosaurus, and 6 others. Older children can check out the interactive scientific encyclopedia from a tiled screen showing the same 10 dinosaurs that appear in the "Play" mode. Tapping on each one leads to a series of narrated, factual entries about that dinosaur, including showing on a world map the location where the first fossils were found and telling a story of the discovery. The interactive portion takes the format of having the player use a brush to digitally sweep away sand to uncover the reptile's fossilized bones. 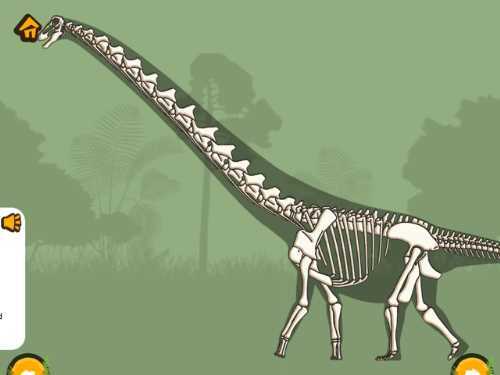 The bones can then be moved onto the outline of a skeleton to put the dinosaur back together again. Another activity involves comparing the size of the dinosaur to familiar things, such as a bus, a human, or even a knight. 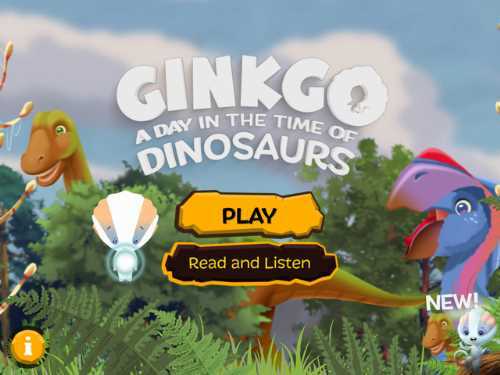 The Ginkgo Dino app invites kids to learn about dinosaurs in ways that are both fun and accessible. Most children are fascinated by these giant creatures of the past. Unlike some resources that make dinosaurs seem dangerous and terrifying, this app offers a gentle introduction. The game portion, with its beautiful animations and lush foliage set in a prehistoric forest, draws kids in by combining self-directed exploration with humor. For example, when players meet Zato the Rapetosaurus, he offers his long, sloping neck to Ginkgo as a slide, and then uses his tail to flip Ginkgo back up to his neck for a repeat ride. And when a roaring Tarbosaurus stomps into a scene, Ginkgo responds by donning a scary mask that intimidates the loud dinosaur. The gameplay of having kids direct Ginkgo's exploration by moving their finger around on the screen is similar to the play mechanics used in the very popular Sago Mini preschool games. By working with paleontologists, the app delivers an encyclopedia filled with dinosaur facts that kids will find interesting. The facts are presented as short narrated paragraphs accompanied by fascinating graphics. Kids will learn about the scientists who discovered each dinosaur and where the finding was made. They will also learn facts such as while Oviraptors looked like birds, they didn't fly. Also great for engagement is how each entry weaves in short interactive activities that kids complete. Don't be surprised if your budding paleontologist starts quoting you unusual facts that you didn't know! 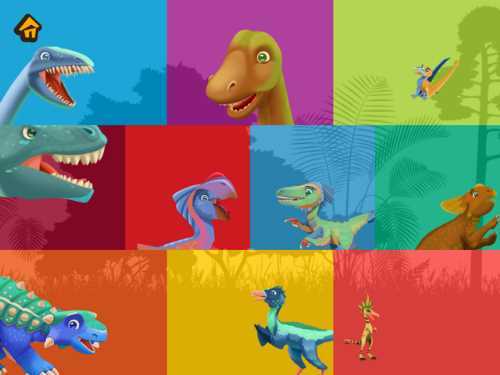 For more great dinosaur apps, check out our rec list of Top Dinosaur Apps. This kids app review of Ginkgo Dino was written by Jinny Gudmundsen.